Chef Jennifer Johnson has been cooking as a pro for almost 23 years, but she had an unusual start in the industry. Jennifer never intended to make cooking her career, but when her 2nd grade son wrote a loving Mother’s Day card full of all the reasons he loved her, it included a side note… he hated her cooking. The perfectionist in her decided to go to culinary school, and 23 years later, Chef Jen has never looked back. 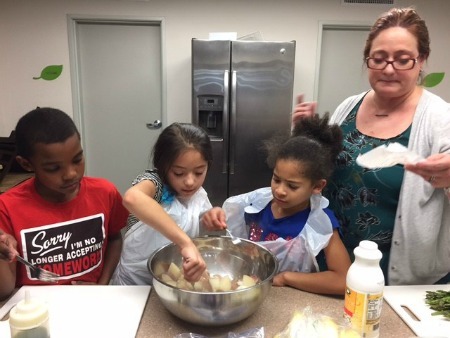 Jennifer’s passion for cooking has made a great companion for her desire to educate and give back to her community. As an active volunteer for A New Leaf, Chef Jen brings delicious, healthy food, wellness education, and organic ingredients to the residents of A New Leaf’s shelters. She believes that organic, healthy foods should not be available only to those who can afford it, and she strives to educate A New Leaf residents about the ways they can find the produce they need. An easy way to get started cooking with health and wellness in mind is to try Chef Jennifer’s Eggplant Parmesan recipe. “A lot of people think they don’t like eggplant,” says Chef Jen, “but my eggplant is awesome. I don’t bread it, I don’t use any flour, and I don’t fry it, so it’s made deliciously, healthfully, and it’s easy to do!” The full recipe is included below, so don’t be afraid to try it for yourself! My recipe is flour and gluten free. It also uses 1/3 the amount of oil found in traditional recipes. I also always use all organic sustainable ingredients. Cook eggplant in oven for 10 minutes (checking so it doesn't burn). It should now be starting to turn brown on the bottom. Turn eggplant over and cook for 5ish minutes more. Remove from oven and let stand for 5 minutes and serve! Note: Contrary to American opinion, Italians do not put garlic and onions in every sauce. They use simple tomato puree and Eggplant Parmesan most certainly - in tradition - does not have any onion or garlic in it. If you want more spice then you can add an Italian mix of herbs from Oregano, Basil, Thyme, Rosemary, and Sage. Use equal parts of each, minced. You can lightly use the spice blend in the Parmesan in the middle and on top. Enjoy and Have Fun!! !